110V transformer and 110V cable reels for industrial site power found in this section of Arc Components Limited. 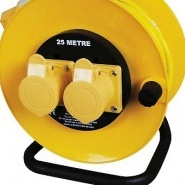 230V and 240V domestic cable reels and sockets for workshop and garage application are also catered for, the section includes protected outdoor trailing plugs and sockets for 110V industrial site power and 230V domestic power applications, a popular range of products for the mobile and site mechanics, engineers and most on-site mobile trades. 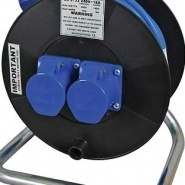 110V AC industrial site work electrical cable reels, extensions, transformers, trailing sockets and plugs. 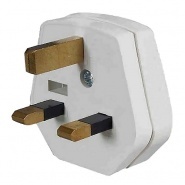 Plug top with sleeved pins, white moulded nylon, 13A fuse approved to BS 1363-A and ASTA-BSI. 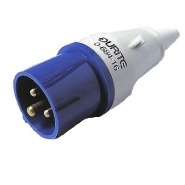 Durite pack of one, 16 amp blue outdoor trailing plug to BS4343. 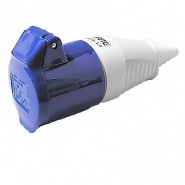 Pack of 1, 230V 16 amp blue outdoor trailing socket to BS4343.